Today 115 Torchbearers will carry the Flame, including Paralympian Giles Long and Olympian Adrian Moorhouse. On Thursday 5 July, the London 2012 Olympic Torch Relay – presented by Coca-Cola, Lloyds TSB and Samsung – will travel 119.65 miles through 17 communities on its journey from Norwich to Ipswich. The Flame will be carried through the following communities: Norwich, Acle, Filby, Great Yarmouth, Lowestoft, Wrentham, Reydon, Southwold, Kelsale, Saxmundham, Aldeburgh, Wickham Market, Ufford, Melton, Woodbridge, Felixstowe, Ipswich. 06.10am – at Hethersett High School & Science College a special photo opportunity will take place with the Flame in a lantern held by the Head Boy and Head Girl of the school to mark Hethersett’s fantastic involvement in London 2012 Games projects over the years. 6.50am – The first Torchbearer of the day will be Paralympian Giles Long who has won twenty major Championship medals including Paralympic, European, and World Championship Gold medals. His greatest achievement was winning the Paralympic 100 metre Butterfly Gold medal, in October 2000, in a World Record time. Giles, nominated through the Coca-Cola campaign, will light the Torch from the lantern in front of the battlements and he’ll carry the flame through Norwich Castle. 10.29am – Gillian Smith, 54 from Watton is an active volunteer for the East Anglian Air Ambulance and will carry the flame past Ness Point which is the most easterly point in the UK. Gillian who was nominated by her husband through the Samsung campaign will pass the flame on to Karen Murray, 33, from Aylsham who has set up the charity Hana's Gift for parents who suffer the heart breaking loss of a baby. Karen was also nominated by her husband through the Samsung campaign. 11.40am – Karen Booth, 47, from Lowestoft has inspired over 2,500 young people to be part of their community and take active roles in supporting others. Karen also runs two youth centres and is instrumental in supporting five others. 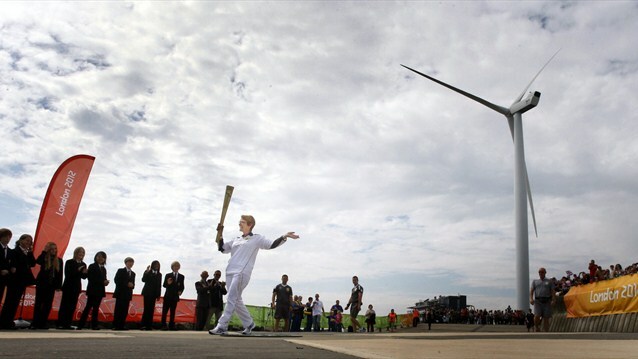 Karen was nominated through the LOCOG campaign and will carry the flame around the Beach Huts at Southwold. 2.14pm – On Aldeburgh seafront the Flame will be carried by Sarah Corbett, 41, from Tunstall who was nominated through the Lloyds TSB campaign for setting up a youth choir and non-profit community theatre group for young people in Suffolk. Sarah will take part in a special photo opportunity with members of the Aldeburgh World Orchestra, who together with players from the UK and across the world who will perform two fanfares written by Aldeburgh Young Musicians William Harmer and Alex Woolf. The fanfares begin at 2pm on Aldeburgh Seafront. 5.49pm – A speed boat will depart from Fox’s Marina in Felixstowe on the River Orwell for Ipswich Marina. The Torchbearer will be Shane Hull, 55, from Norwich who was nominated through the Samsung campaign for his work as the Chair of the Hethersett Olympic Events Committee, a working group which Shane set up to galvanise the local community into engaging with the Olympic Games. 6.50pm – The last Torchbearer of the day Nicola Hunt, 27, from Ipswich who was nominated by Ipswich Borough Council through the LOCOG campaign will carry the Flame into the Evening Celebration in Christchurch Park, Ipswich. Nicola is a talented archer and won her first individual international medal at the European Indoor Championships in 2008. In 2009 Nicky became the first Britain to win a World Cup stage and ended the World Cup Series ranked 1st. She won Individual and Team gold at the 2010 Commonwealth Games in Delhi - England's first archery gold medal at the Commonwealth Games for 28 years. The evening celebration will take place in Christchurch Park in Ipswich. It will feature a variety of entertainment staged by LOCOG and the three Presenting Partners of the London 2012 Olympic Torch Relay - Coca-Cola, Lloyds TSB and Samsung - with support from Ipswich Borough Council. The show will start at 5pm. The line-up includes music from Morning Parade, a dance troupe who will provide a unique fusion of street performance, theatre and sport and dance act Twist and Pulse. There will also be performances by the Aldeburgh Young Musicians, Group A and DanceEast. Towards the end of the show, the last Torchbearer of the day – Nicola Hunt - will light a celebration cauldron on stage at the event which will enable the Olympic Flame to be seen by the audience. Sally Hancock, Director, London 2012 Partnership at Lloyds TSB, said: ‘We are looking forward to the Olympic Torch Relay continuing its journey across East Anglia and bringing the excitement of London 2012 to the heart of communities along the way. Lloyds TSB is creating as many opportunities as possible for people to get involved as the Relay passes their door. Adrian Moorhouse, during the late 1980’s Adrian dominated world swimming, holding his place as World No.1 for six consecutive years. He cemented himself as a figurehead of British and International, swimming when he won the gold medal for 100m breaststroke at the Seoul 1988 Olympic Games. Throughout his career it was his epic rivalry with the Canadian Victor Davis which captivated audiences worldwide. He retired from swimming in 1992 at the age of 28 and wanted to embrace a career in business to ensure he utilised the skills and experience learnt from his athletic career. So, in 1995 Adrian co-founded Lane4, a leading performance development consultancy with a unique heritage in elite sport and business performance. Constance Adam, 84, from Norwich who was nominated through LOCOG’s campaign by Norwich City Council, started fencing when she retired at 60. Connie is the second Torchbearer of the day and will carry the Flame in Norwich in recognition for her success at fencing – she has won over 100 medals since taking up the sport. Last year Connie won a bronze at the World Veteran Fencing Championships (where all of her competitors were at least 13 years younger than her) and has proved that age is no barrier to trying something new and being an inspiration to others. Eddie Graver, is an 18-year-old shooter and Lloyds TSB Local Hero from Beccles. He was selected by Lloyds TSB because of his commitment and dedication to his sport of shooting and inspiring his peers through encouraging new and inexperienced shooters in his community. Eddie, who is carrying the Flame in Lowestoft, has achieved a bronze team medal, a silver team medal and a silver individual medal whilst representing England. James Shiplee, 20, from Bungay is carrying the Flame in Wrentham having been selected through the Coca-Cola Future Flames programme for being a dedicated football coach, being selected as one of the top 100 Young Football Leaders in the country and his ambassadorial work for Suffolk FA. Matthew Sandbach, 31, from Bury St Edmunds is carrying the Flame in Melton. Matthew was nominated through the Samsung campaign for his dedication and strong service record as Apache helicopter pilot in the Army Air Corps. As the only National Presenting Partner of the London 2012 Olympic Torch Relay, Lloyds TSB will be taking the inspiration and excitement of the Olympic Flame right to the heart of communities across the UK. As part of Lloyds Banking Group, Bank of Scotland will be the National Presenting Partner in Scotland. We are creating as many opportunities as possible for communities the length and breadth of the UK to get involved as the Flame travels past their front doors. Lloyds Banking Group is Britain’s biggest corporate investor in UK communities and in 2011 invested £85 million and as part of the Group’s Community Investment Programme, we’ve launched the Lloyds Banking Group Community Fund to give back to the communities in which we operate and pass through on our journey with the Olympic Flame. We’re inviting everyone to visit the Lloyds TSB stand at each Evening Celebration to vote for a community project in their area that inspires and supports young people. By voting at the Evening Celebration members of the public will automatically enter a draw to win four tickets to London 2012. The two projects that receive the most votes at each locality will each win a £5,000 grant from Lloyds Banking Group. At the Lloyds TSB site members of the public will also have the opportunity to have their photo taken with the Olympic Torch, meet Lloyds TSB Local Heroes – the future stars of Team GB and ParalympicsGB – and get up close to our Flame Followers. To find out how you can join in the celebrations with Lloyds TSB. As a Presenting Partner of the London 2012 Olympic Torch Relay, Samsung aims to encourage everyone to be part of the greatest show on Earth to make London 2012 ‘Everyone’s Olympic Games.’ We aspire to offer new and memorable experiences for everyone around the world through our own innovative and smart wireless technology. Samsung is providing 1,360 Torchbearers, who have “gone the extra mile” by contributing to the local communities, through its worldwide public nomination campaign. In total over 25,000 nominations were received. Samsung will support towns and cities to celebrate the exciting moment of the Torch Relay and help showcase Great Britain’s cultural landmarks to provide a more enjoyable experience to everyone. The evening celebrations that will be staged by Samsung in 66 towns and cities throughout the Olympic Flame’s journey across the UK, will allow Samsung to entertain the community they are visiting. The Samsung caravan, complete with LED screen on the side showcasing runners and goodwill messages, will follow the Torchbearers around the UK cheering up everyone to celebrate the Torch Relay with music and interaction with local communities. It is Samsung’s ambition that London 2012 will be an event that reaches and involves more people than on any other Olympic Games occasion. Last November LOCOG launched a grassroots programme inviting the nations Local Leaders to step forward and start planning local celebrations to celebrate the spirit of the London 2012 Olympic and Paralympic Games. Today there are over 14,000 London 2012 Local Leaders across the country planning community events to Line the Streets for the Olympic Torch Relay. In the East of England 1153 people have signed up as Local Leaders, like Angela Bishop from Acle Village, Norfolk. Angela has helped organise a whole day of activities to greet the Torch Relay as it passes through Acle at 8:06am. This includes ringing the church bells, music from local bands and singing and dancing from local schoolchildren. There will be bunting and homemade banners while people living along the route have decorated their gardens with red, white and blue floral displays.